"Ms. Lee once said of her motive for art making, “What I feel is a sort of violence,” a quotation that was repeated in the press far more than she would have liked. I think this “violence” was simply ambition — lots of it." Murray talked about Doris Lee and her husband, Arnold Blanch as part of the group of painters/illustrators who were setting the stage for the storybook illustrators such as Alice and Martin Provensen, Mary Blair, Art Seiden, Jan Balet. Murray said that though Arnold Blanch and Doris Lee were lesser known painters of the time, but their circle which included Stuart Davis and Milton Avery which suggests their style and approach. The New York Times in April (2008) had an article that started with almost a warning and evolving to an embrace of Ms. Lee, her work and the show at the D. Wigmore Gallery that showcased many works from her estate. Look at that palette. Look at these simple compositions. 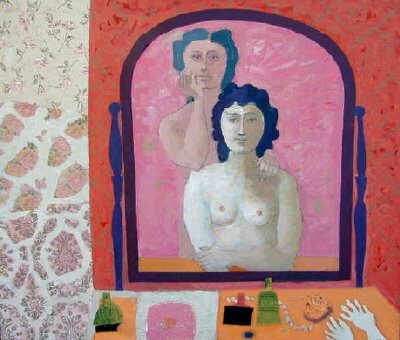 Her figures reference (in this group) Milton Avery and in some cases Morris Hirschfield. Her palette parallels Milton Avery's late work's palette. Look at how she handles the flowers in the composition with the woman. Look at how Arnold Blanch handles the same thing (below) And Arnold's women really are inspired by Picasso. Wow. I am going to explode! I am spinning. My head is spinning. I am trying to figure out what I am. Topsy Turvey..but with Murray pointing to Doris Lee and the list of artists I need to see...there is something there...but I have this tree to do...and am going somewhere, but down the wrong alley. But, I like Leonard Baskin, Eleanor Ness, Harry Clark and a bunch of line folks too. However, I need to keep going and make some pictures to draw my way out of this one. Heck, I got through the whole mortality thing through 300 drawings about death and mortality. This should be a walk through the garden to partake of the Tree of Knowledge. At least, there is hope.